The Ohio and Erie Canal was completed in 1834 between Cleveland and Portsmouth, Ohio. This 308-mile-long canal was the final link in an inland waterway connecting the Great Lakes and the Mississippi River System. The Canal allowed goods to travel from Ohio down the Mississippi to the Gulf of of Mexico and from Cleveland on Lake Erie to Buffalo and from there to the east coast. A continuation of the Erie Canal, the Ohio and Erie Canal was funded, designed and constructed by New York financiers, engineers and the Irish immigrant labor gangs. This water route was a significant part of the American System, the interstate transportation infrastructure needed to establish a national economic system for the young Nation. The canal laid the foundation for Ohio’s industrial, commercial and political development. It provided an economical way to transport goods that promoted specialization, economies of scale and the growth of profitable commerce. In addition to revenue from tolls, leases of waterpower and the rental of canal land, Ohio also gained innumerable advantages. The value of land and products in the state increased and thousands of new inhabitants settled in Ohio along the canal area. 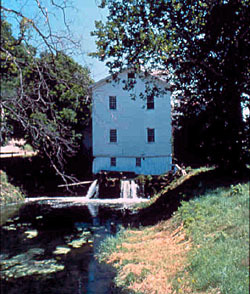 The prosperity in Ohio led to the development of small towns and cities along the waterway. Ohio City, Clinton, Canal Fulton, Navarre and Bolivar were canal villages. Cities such as Cleveland, Akron and Massillon also thrived; they became nationwide leaders in shipping and production of wheat, grains, iron and steel. Merchants from Buffalo increased their purchases from Cleveland's wheat market from 1,000 bushels annually to more than 250,000 within one year of the canal opening. The canal was in active operation from its completion until just before the Civil War. By 1863 competition from the railroads was intense and the canal fell into disuse. 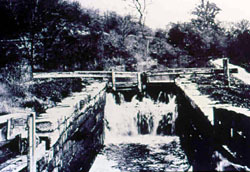 In 1904 the locks were repaired and the canal was used mainly for pleasure boating. When a flood occurred in 1913 the canal was damaged too extensively for repair and so the canal era was brought to an end. Many of the original locks remain, as do mills, houses associated with the canal and an aqueduct. A 20-mile stretch of the canal towpath is used for hiking and biking, with exhibits along the path identifying natural and cultural points of interest and explaining the function of the canal structures. The designated section of the Ohio and Erie Canal, a National Historic Landmark encompasses 24.5 acres along the canal and State Rt. 631 in Valley View township. The canal is administered by Cuyahoga Valley National Park. The Ohio and Erie Canal has also been documented by the Historic American Buildings Survey. Use the search box for properties associated with the Ohio Erie Canal. The Ohio and Erie Canal is the subject of an online-lesson plan produced by Teaching with Historic Places, a National Park Service program that offers classroom-ready lesson plans on properties listed in the National Register. To learn more, visit the Teaching with Historic Places home page.